When all have gathered, a suitable song may be sung. The leader makes the sign of the cross, and all reply “Amen.” The leader may greet those present in the following words: Let us glorify Christ our light, who brings salvation and peace into our midst, now and forever. R/. Amen. In the following or similar words, the leader prepares those present for the blessing: My brothers and sisters, amidst signs and wonders Christ Jesus was born in Bethlehem of Judea: his birth brings joy to our hearts and enlightenment to our minds. With this tree, decorated and adorned, may we welcome Christ among us; may its lights guide us to the perfect light. One of those present or the leader reads a text of sacred Scripture, for example, Titus 3:4 (lines 4-7) or Ezekiel 17:22 (lines 22-24 4; I will plant a tender shoot on the mountain heights of Israel.) Reader: The Word of the Lord. R/. Thanks be to God. The intercessions are then said. The leader says: Let us ask God to send his blessing upon us and upon this sign of our faith in the Lord. R/. Lord, give light to our hearts. That this tree of lights may remind us of the tree of glory on which Christ accomplished our salvation, let us pray to the Lord. R/. 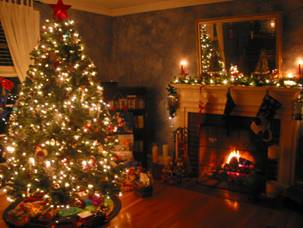 That the joy of Christmas may always be in our homes, let us pray to the Lord. R/. That the peace of Christ may dwell in our hearts and in the world, let us pray to the Lord. R/. After the intercessions the leader invites all present to say the Lord’s Prayer. The leader says the prayer with hands joined: Lord our God, we praise you for the light of creation: the sun, the moon, and the stars of the night. We praise you for the light of Israel: the Law, the prophets, and the wisdom of the Scriptures. We praise you for Jesus Christ, your Son: he is Emmanuel, God-with-us, the Prince of Peace, who fills us with the wonder of your love. Lord God, let your blessing come upon us as we illumine this tree. May the light and cheer it gives be a sign of the joy that fills our hearts. May all who delight in this tree come to the knowledge and joy of salvation. We ask this through Christ our Lord. R/. Amen. The lights of the tree are then illuminated. The leader concludes the rite by signing himself or herself with the sign of the cross and saying: May the God of glory fill our hearts with peace and joy, now and forever. R/. Amen. The blessing concludes with a verse from “O Come, O Come, Emmanuel”: —From "Catholic Household Blessings & Prayers"
All make the sign of the cross as the leader says: Our help is in the name of the Lord. R/. Who made heaven and earth. One of those present or the leader reads a text of sacred Scripture, for example, Luke 2:1 (lines 1-8) or Isaiah 7:10 (lines 10-15, the birth of Emmanuel). Reader: The Gospel of the Lord. R/. Praise to you, Lord Jesus Christ. The leader prays with hands joined: God of every nation and people, from the very beginning of creation you have made manifest your love: when our need for a Savior was great you sent your Son to be born of the Virgin Mary. To our lives he brings joy and peace, justice, mercy, and love. 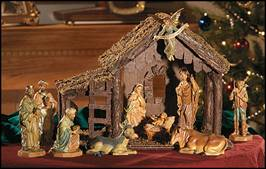 Lord, bless all who look upon this manger; may it remind us of the humble birth of Jesus, and raise our thoughts to him, who is God-with-us and Savior of all, and who lives and reigns forever and ever. R/. Amen. —From "Catholic Household Blessings & Prayers"